You can book instantly or make a non-binding reservation. The following Extras are available to book with this venue. Hover over the Extra with your mouse to view more details. 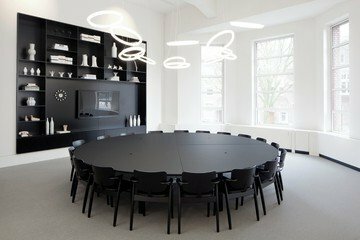 This modern conference room for rental in The Hague is fully equipped. There is a TV available for your presentations and a flipchart for productive brainstorming sessions. There is scientific proof that a round table contributes to creating a group feeling, which results in a more positive meeting. The natural light makes this area complete and perfect for your next meeting. The location is easy to reach by both car and public transport. Hi, my name is Heleen De Maeyer. Can I help you find a space? Please read terms and conditions. No, I do not agree.